EASTER - 15% off all stays across remaining available dates between the 12th - 26th of April 2019 and a champagne reception for guests on arrival. Discount will be applied at time of booking. Offer valid from the 6th March 2019. Save up to £1,000 on 3-night weekend stays between the 3rd of May - 1st of September 2019. Discount has already been applied to advertised rates. Offer valid from the 26th of February 2019. Chevaliers Estate makes a magical setting for a group celebration or get-together, the Grade 1 historic estate is brimming with charm and character and holds a wonderful position within beautiful English countryside. The house is located in a secluded hamlet deep in unspoilt Shropshire countryside, making it a tranquil haven which is perfect for those really looking for an escape. The accommodation is set across the Gatehouse, Moat House and Coach House. The properties all offer guests the chance to ‘holiday in history’ with the opportunity to have privacy while still being set with 100 yards of friends and family in the other buildings. The Gatehouse, Moat House and Coach House, each both two bedrooms with en-suite bathrooms. The Gatehouse, Moat House and Coach House, each come complete, with excellent living, kitchen and dining facilities. The shared and private gardens are just as beautiful with guests of the Estate having access to the historic gardens of the Hall. The Gatehouse has a private, enclosed garden complete with a fountain, dining facilities and a barbecue can be provided on request. Similarly, The Moat House and Coach House both boast their very own sun terraces, the perfect spots for guests to enjoy their morning coffee! 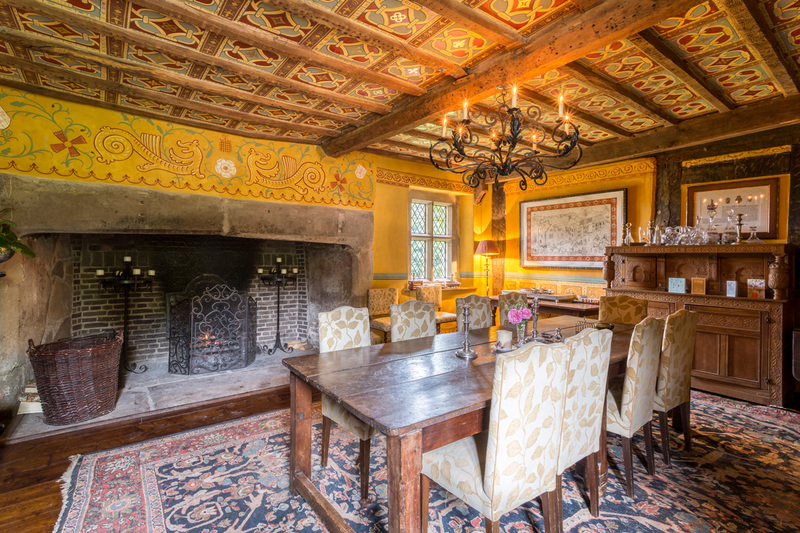 *For those in smaller parties who would still like to experience the beauty and history of Chevaliers Estate, it is possible to simply rent just the Gate House or Moat House. **Please note that those staying in groups of 12 or less will not have access to the private wing. For those in larger groups, photos of the wing are available upon request. The Estate accommodation is set out over the Gatehouse, Moat House, Coach House and a private wing of the main house. The Gatehouse accommodates up to four guests in two seperate suites and has its own private garden with fruit trees and a fountain. 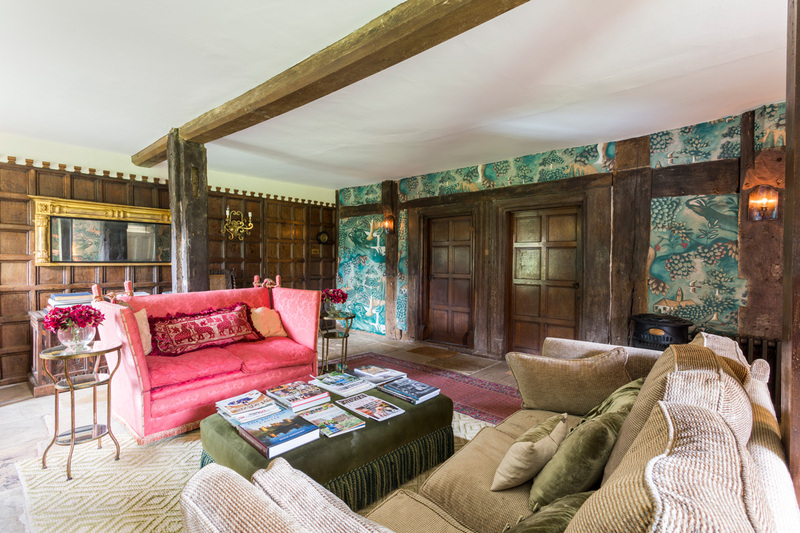 Accommodating four guests across one level, the former 19th century coach house with exposed oak beams boasts a large sitting room and access to a private patio. Chevaliers Estate is situated within a secluded hamlet deep in the Shropshire countryside, but lies within four and a half miles of historic Bridgnorth and four miles of the pretty market town of Much Wenlock. Next to the Hall is the historic Norman church of St Michael with its 12th century wall paintings and famous 12th century font. Chevaliers Estate remains a haven of peace and rural beauty today – an ideal place to explore Shropshire and the Heart of England, from the gastronomic centre of Ludlow to the Ironbridge Gorge Museum, the Shropshire hills and many other historic houses and gardens, including the Dower House Gardens in nearby Morville of Dr Katherine Swift (author of the bestselling book The Morvile Hours) and the world famous nursery gardens of David Austin Roses. Chevaliers Estate is conveniently located for access to the M5, M6, M54 and M40 motorways. The nearest station is fifteen miles away with frequent inter-city trains from London, Manchester and Glasgow and services to Wales and the West Country. If you are having a special gathering, celebrating a birthday or anniversary then the owners can arrange a lovely 3 course catered dinner (excluding wine) for £65 per person, with a waitress and butler in the Gatehouse. If you want to make your stay extra special a champagne reception in the Grand Salon between 7.00 - 8.00 followed by dinner in the Grand Salon can also be arranged. The Grand Hall is the perfect setting to enjoy a candlelit dining experience in front of a Tudor fireplace fit for a royal palace, surrounded by murals and a gold leaf painted ceiling by the renowned artist Adam Dant. * Please note there is an additional £800 for hire of the Grand Salon and The Great Hall. Dinner: £65 per head for Three Courses (excluding Wine) and Coffee. Wine List which can be provided upon request or guests can bring their own wine with corkage at £7.50 a bottle. Security deposit £1000 for 3 days, £1500 for 7 or more days. Credit card authorisation required, it is refunded in full subject to a damage inspection on departure.